Kattula S, Byrnes JR, Wolberg AS. 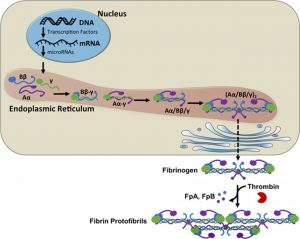 Fibrinogen and Fibrin in Hemostasis Thrombosis. Arterioscler Thromb Vasc Biol. 2017;37:e13-e21. Byrnes JR, Wolberg AS. Newly-Recognized Roles of Factor XIII in Thrombosis. Semin Thromb Hemost. 2016;42(04):445-454. Walton BL, Byrnes JR, Wolberg AS. Fibrinogen, red blood cells, and factor XIII in venous thrombosis. J Thromb Haemost. 2015;13(Suppl. 1):S208-S215. Arterial thrombosis. Abbreviations: TM, thrombomodulin; II, prothrombin; IIa, thrombin; Fgn, fibrinogen; TF, tissue factorWolberg AS, Aleman MM, Leiderman K, Machlus KR. 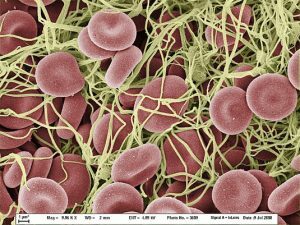 Procoagulant activity in hemostasis and thrombosis: Virchow’s triad revisited. Anesth Analg. 2012;114(2):275-285. Gray LD, Hussey MA, Larson BM, et al. Recombinant factor VIIa analog NN1731 (V158D/E296V/M298Q-FVIIa) enhances fibrin formation, structure and stability in lipidated hemophilic plasma. Thromb Res. 2011;128(6):570-576. Campbell RA, Aleman MM, Gray LD, et al. 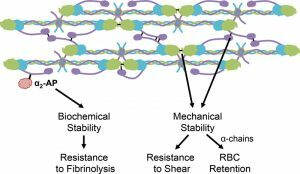 Flow profoundly influences fibrin network structure: implications for fibrin formation and clot stability in haemostasis. Thromb Haemost. 2010;104(6):1281-1284. Wolberg AS, Aleman MM, Leiderman K, Machlus KR. 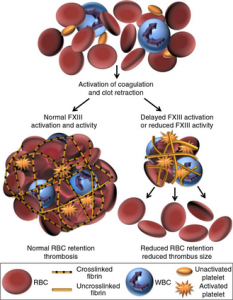 Procoagulant activity in hemostasis and thrombosis: Virchow’s triad revisited. Anesth Analg. 2012;114(2):275-285. Machlus KR, Cardenas JC, Church FC, Wolberg AS. Causal relationship between hyperfibrinogenemia, thrombosis, and resistance to thrombolysis in mice. Blood. 2011;117(18):4953-4963.